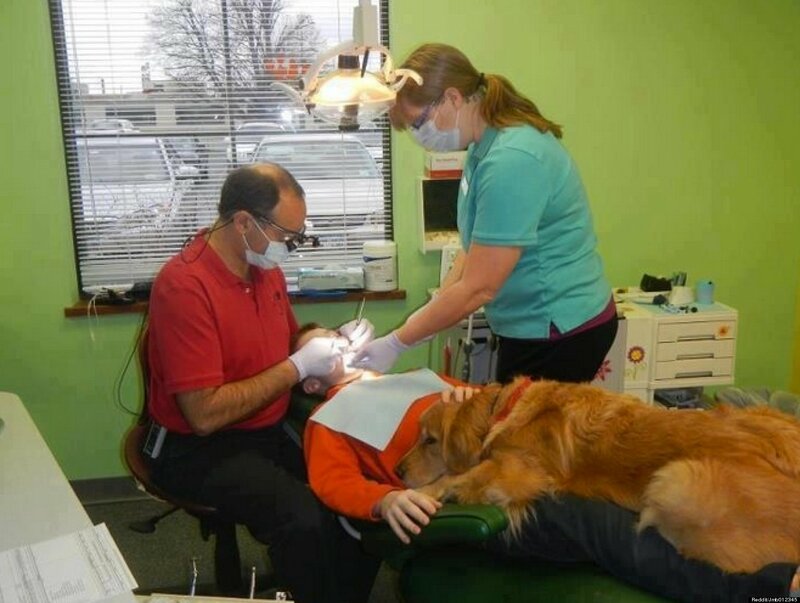 Extraordinary Dogs: Brooke the Therapy Dog wins hearts of pediatric dental patients! Brooke the Therapy Dog wins hearts of pediatric dental patients! For kids, going to the dentist isn't always fun, but one dentist has found a way around that situation. Meet Brooke, a four year old Golden Retriever. Pediatric Dentist Doctor Paul Weiss has been bringing Brooke to work with him twice a week for about six months now. His patients just love her. Every Thursday morning, patients are greeted with a warm and fuzzy reception when they arrive for their visits at Dr. Paul Weiss' pediatric dental office in Williamsville, USA. The newest staff member, Brooke, a four-year-old Golden Retriever, is using her talents as a certified therapy dog (certified by Therapy Dogs International) to interact with and entertain patients and their families. She works the reception area with her handler, offering and receiving lots of affection and hugs and occasionally chasing down her favorite ball. Her calm and gentle demeanor, friendliness to strangers and receptiveness to physical contact make her the perfect addition to the playful child-oriented surroundings of the office. The match between Brooke and the patients seems perfect. As a Golden Retriever, her primary purpose in life is to please those around her. She gets the love that she needs and she can help take the child's and parents' mind off their fears. Like all therapy dogs, Brooke was required to pass a rigorous training program and evaluation. She mastered basic obedience and proved she is able to accept common medical appliances, clumsy handling (petting) and various distractions. Therapy dogs have been shown to ease tensions, lower blood pressure and increase positive attitudes. Traditionally, their services are utilized in hospitals, schools, and retirement homes. Knowing Brooke's temperament, Dr. Paul recognized an opportunity to offer another source of comfort to his patients and increased relaxation to the office atmosphere. Brooke has become a celebrity with patients, who now make it a point to schedule their appointments on Thursday, now known as "Brooke Day." I came to this dentist after recommendation from another dentist, whom i had been seeing for 10 years. I have found dentist Manhattan Beach very kind, knowledgeable, and compassionate.